Opened on October 21, 2015, Hawaiian Experience Spa’s Goodyear, Arizona day spa is our third location. All of our spas are privately owned by the Ibach family who founded the Hawaiian Experience Spa concept (read more about us) in 2007. 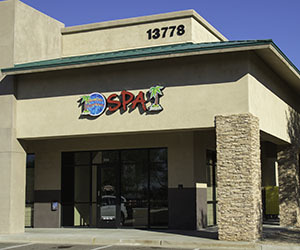 The spa is located in the Palm Valley Pavilions center on the Northeast Corner of Litchfield and McDowell Rds., close to Avondale, Buckeye, Litchfield Park, and West Phoenix. Our Goodyear, AZ location is over 2,600 square feet with massage rooms, a facial room, couples’ massage rooms, two exotic showers (big enough for two in case you bring a partner), a beautiful lounge, a complimentary tiki bar, and much more. It is the first spa we are building from scratch so it has a custom design perfectly suited for the Hawaiian Experience. Please feel free to stop in for a tour! Aloha. Hours: 9 am – 9 pm seven days a week! Directions: Take route 10 to the Litchfield Road exit. Go north two lights to McDowell. Turn right on McDowell and then left into the shopping center. The spa will be to your right as you drive back. The Goodyear day spa is convenient to Avondale, Buckeye, Litchfield Park, Phoenix, and other area Arizona cities. We have great career opportunities for experienced and entry level massage therapists in Goodyear, AZ. Visit our Goodyear Massage Career page for more information on working as a massage therapist in our Goodyear day spa.